Catherine Steele was born in 1883 at Cille Pheadair, South Uist, Scotland, the daughter of Roderick and Mary (O’Henley) Steele. She married William MacLellan on May 8, 1906 at Boisdale, South Uist, Scotland. 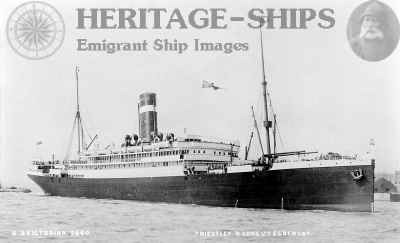 The new MacLellan family emigrated to Canada in 1924, sailing from Liverpool aboard the SS Marloch, landing at St John, New Brunswick after a 21 day voyage. They homesteaded in the Shoal Creek area, raised their family, farmed and helped to establish the community. With the volume of traffic on this blog from Canada, it seems appropriate to open a page on the Maritime Provinces, taking in not only CB, Nova Scotia and Prince Edward Island, but also the emigration hotspots for Uist and other Hebridean folk around Ontario, Alberta and Saskatchewan. Of particular interest to PEI visitors should be the story of Annie Beaton from Dr Douglas Malcolm. The SS Marloch (previously named SS Victorian while in service with the Allen Line) of the Canadian Pacific Line upon which the MacLellan family sailed from Lochboisdale in 1924. Passenger lists can be found at Marloch Passenger List1 and Marloch Passenger List2. Back stories on different schemes that promoted emigration to Canada can be found at Scots in Canada. @Don, quick question. How did you determine the places for the passengers on the Jane? I am specifically wondering about Ardgasrig being on South Uist? I cannot find where that is located. I don’t think it was me that did this search and my initial stab places Ardgasrig possibly in Glen Moidart as recorded in the Glen Moidart Papers. (Click on the Glen Moidart Papers link and the details of the Jane passenger list will come up). You probably have this list already and I see a number of passengers with South Uist addresses also appeared in the list. They must have made their own way to Drimindarrich for the sailing but how they managed to find their own way there I would not know. It appears that Clanranald (who presumably chartered the sailing) did not instruct the Jane to take a detour before it headed West into the Atlantic for Canada. Rather mean and inconsiderate of Clanranald but par for the course at the time. From some PEI papers I believe the numbers from South Uist settling in PEI around the turn of the nineteenth century measured around 500 and possibly more. I’m assuming that the McKinnons were from near-by on South Uist. I browsed through the old map browser for anything similar and found an Ard Gaidinish …. Do you have a link for that Old Map Browser? I seriously doubt that Clanranald had much to do with chartering these emigrant ships. The last thing the laird had in mind was losing the tenants who were supporting him. He was becoming quite well off selling kelp and paying his tenants less and less for their labors in gathering it. Differences in religion also played a part in this exodus according to a number of family accounts of those who left the Outer Hebrides and sailed to Canada.The majority of those who left the Clanranald and McNeill estates were Catholics and were getting a lot of pressure from their lairds to convert, which they refused to do. I mentioned in a previous post that when my McLellan ancestors decided to leave South Uist in 1790, the laird of Clanranald threatened those who lived around them against buying any of their stock. Clearly, he was trying to prevent their leaving his estates. According to another account, related by Fr. A. E. Burke in “The Burke Chronicles” written around the mid 1880’s, residents who lived on Barra had a religious disagreement with their laird (McNeill) in early 1790 and subsequently told their laird they were emigrating. They went to a Bishop MacDonald who was visiting Tobermory on the Isle of Mull. Making their case for emigration to him, they were given a letter to a Colonel Frazer in Edinburgh, an officer who was promoting emigration. They were promised a ship if they could muster three hundred fifty emigrants.The required number, according to Burke, was made up by the addition of some families from Uist and from the Mainland.There was no ship in 1790 that could carry 350 emigrants. Thus, there were three ships that sailed from the west coast of Scotland in 1790: The Lucy, The Jane and The British Queen. All carried emigrants from the western isles. The accuracy of names and placenames on these passenger lists should not be considered as completely accurate. They are transcriptions, and are posted on a variety of websites, and there are disagreements among those various posts. My fourth great grandfather, Angus McLellan with his wife and two small sons, sailed on The British Queen. They left Arisaig on the 16th of August 1790, bound for Quebec City. Their ultimate destination was said to have been Glengarry in Upper Canada but the ship’s captain “deceived them” according to John R. McLellan’s 1898 biography, telling them there was smallpox in Quebec. They were landed in Charlottetown, PEI where they were met by the proprietor of Lot 18, who was smart enough to know when to go down to the docks. These mostly ex military veterans, who were lot proprietors on PEI, were among a number of those who had been granted properties in a lottery. They were required to settle a minimum number of people on their lots or the Crown would take the lands back. My ancestors settled on Lot 18 in Indian River, and later some went to Lot 14 in Grand River. Their descendants can be found there today. 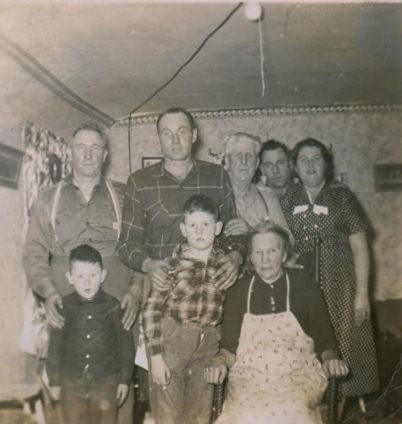 An elderly MacLellan cousin and family historian in PEI once said to me that he believed our ancestors might have given place names and surnames that were meant to disguise who they were and where they had come from when they left for Canada. The family biography, written by John R. McLellan in 1898, undoubtedly came from stories he was told by his immigrant grandparents. He wrote that when the Laird learned the McLellans planned to leave his estates, he warned their neighbors not to buy any stock from the them or he would “tear down their houses and throw the stones into the sea to gather kelp”. Hopefully the Laird did not make good on his promise, but disguising their names and/or place name origins might have seemed like a sensible gesture by those who were departing and leaving neighbors and other family members behind. My O’Hanley came to Canada from South Boisdale, South Uist, in 1851 and he settled in Galt Town,Ontario, which is approximately one hour west of Toronto. Allan was born in 1811 in Milton, South Uist and he married Janet McDonald who was born in North Uist in 1813. Their children were Janet 1836, Murdoch 1838, Angus 1839, Angus? 1841, Murdoch? 1845, Neil (my great-grand-father)1850. Do you know the parents of the Janet MacDonald whom you mention in your message and where in North Uist she was from? Adding a little bit to the thread on the Jane and Lucy. (Bishop) Angus Bernard McEachern from Kinlochmoidart travelled on the Jane and he later became a Bishop. Angus McIntyre & wife Sarah McKinnon travelled on the Jane as well. Angus’s obituary stated he was from Stoneybridge, South Uist. Murdoch McKinnon travelled on the Jane as well. I suspect he is listed as “Marian MKinnon” from Ardgasrig. Anyone know where that is, as I am descended from him, it would be nice to know. Just to comment on the family photo. Catherine Steele is my husband’s father’s sister. It looks to be Arisaig (most likely) or Ardersier ? both in Scottish Highlands. I just came across the book “A Registry Of Emigrant Families From The Western Isles Of Scotland” published in 1996. In it I found my ancestors Allen O’Henley, his wife Janet MacDonald and their children, Janet, Angus, Neil and Murdoch. I would like to know if anyone has information on them prior to their emmigration to Canada. The MacLellans left South Uist for Canada around 1790, I believe that was long before the lighthouse was built. Thanks for the links to those great pictures of South Uist. I do think that I have found Glaich Laith though. To the northeast of Uisinish there is an inlet called Mol a’ Tuatha. Just to the east on a small stream called Alltan Chaluim is a place called Glacklee. On a different map it is called Glaglee. I believe that this is an Anglicized version of the Gaelic Glaich Laith. Can anyone verify if this is true?? It looks like Holly McClellan is indeed related to you then as her John MacLellan left Uisinish in 1787. I overlooked the date of emigration which of course now makes the lighthouse angle irrelevant to the MacLellans. It still begs the question what they were doing in such a remote spot. Anyone looking to retrace their tracks had better have a good strong pair of walking boots on them! My gut tells me those MacLellans were there for a reason, hopefully not as pirates or scavengers! If that piece of coast was so badly in need of a lighthouse there must have been quite a few wrecks. Beachcombers is alright as the sea would often give up its bounty. Note that Glack and Liath are both included. I have only just come across this thread. I do not have anything to add to the 1790 migration, I am afraid but do have a few things that may be of interest to various of you who have contributed. The Uist tradition is that these MacLellans arrived when two MacAulay brothers came from Clanranald’s mainland estate as grooms to the Captain’s horses. They brought with them a young nephew, Iain MacLellan, whose family were the keepers of the Church at Eilean Finnan in Arisaig. Iain, later known as Iain Mor, settled at Loch Eynort, flourished and, so the story goes, it was some of his descendants who moved into North Uist and became Protestant. In turn some of this North Uist tribe later moved back to South Uist so untangling them is a bit difficult. There was a later set of these MacLellans in Benbecula, there being said to be a family of ten, the youngest seeming to be the Roderick MacLellan who with his family was on the ill-fated Barque Lulan migration to Pictou in 1848. Most of that family seem to have headed to PEI but those who remained were tradition bearers who gave Alexander Carmichael material for his collection of Gaelic verse, Carmina Gadelica. Roderick settled at Lot 54, PEI and, apparently, family are still in the area. The MacLellans who never left the Loch Eynort area include Angus MacLellan MBE, whose Stories from South Uist and The Furrow Behind Me, were translated and published by John Lorne Campbell and remain in paperback print for anyone interested. Angus’ mother was from the MacMhuirich bardic family that had served the Lords of the Isles and then Clanranald from 1220 or so until 1800 so it is not surprising he was a seannachie. The well known piper and singer today, Rhona Lightfoot is of this descent. The neighbouring Glac Liath was always regarded as a distinctly spooky place, inhabited by otherworldly inhabitants and only one clann, the MacIsaacs were entirely welcome and comfortable there. The whole area was cleared in the 1840s by Colonel Gordon’s factors once he bought South Uist from Clanranald and the people resettled at Caolas Eriskay and other infertile places where they depended on scavenging along the seashore and many more then emigrated around 1850. Thank you Angus. Great story. I had a distant cousin who corresponded with Angus MacLellan MBE for quite awhile and she gave me copies of their letters. He remembered hearing stories of MacLellans leaving South Uist for Canada way back. Yes, Glaich Laith is near Loch Eynort. The untangling of ancestors is getting easier by the day, thanks to genetics. There is a McClellan (apologies for the Americanized spelling) YDNA Surname Group at FamilyTreeDNA with a good number of participants, plus now a new co-administrator has formed a group within the surname group for those who have traced their lines to The Outer Hebrides. Of interest, so far, the MacLellans who trace their ancestry to North Uist do not seem to match those who came from South Uist. For anyone who has had their YDNA done, this website is certainly of interest. And for those who haven’t considered this, what are you waiting for? Genealogy and genetics are going hand and hand into the future, and the past. The two McLellan brothers who came to PEI from South Uist in approximately 1790 (I believe they arrived on The British Queen) were not sons of the same father. An elderly woman, married to a MacDonald on PEI, supposedly told her nephew that the elder McLellan brother was fostered by the McLellans on South Uist and was actually the son of a MacDonald but she didn’t say which particular fellow. There was much speculation spent in the 20th C. on the possible association with Angus Og MacDonald, but the science isn’t there. The elder brother does in fact look to have been a MacKinnon, rather than a MacDonald. Clan MacDonald has a very large database of YDNA and the McLellan male descendants of the elder brother who have done the YDNA tests do not match anyone in their database. They do, however, very closely match three MacKinnons with ancestral lines to Skye in the overall databases from several YDNA websites. With regard to the farm account book of Alexander McLellan which Kipp Sturgeon has outlined in a previous post, there is valuable information in that account book, but the family history account in that book, signed by Joseph G. McLellan, is not an original work. It is a transcription of a published family biographical sketch authored by John R. McLellan of Indian River. It was published on page 1 of The Summerside Journal in Summerside, PEI on 9 March 1898. The similar version written into the account book above is placed near entries from the mid 1800s but the placement of it there has nothing to do with when it was written. Joseph G. was born in 1878. He chose to change the wording of paragraphs that related to personal recollections of events his cousin recalled from the 1830s and then signed his name at the end, as if he had written it. I’ve notified Kipp Sturgeon of this, just this week. I’ve studied this very carefully before making this sad determination of a deception. The familial connection between Angus MacLellan, the author or storyteller, and our McLellan line is still unclear. Our list of ancestors is quite different from Angus’s but I believe he generally accepted the possibility. Our lines are said to have been Angus (the younger immigrant McLellan ‘brother’ who came to PEI), who was the son of Donald, he the son of Angus, son of Donald, son of John, son of Philip. Angus’s list was quite different. Until we have YDNA evidence from someone who can trace his MacLellan line back to Angus’ paternal lines, it is all just speculation. Much can be lost in translation from the original Gaelic and most of these families who settled on PEI spoke their own form of Gaelic until well into the 19th Century. I’ve always believed the place name was possibly misunderstood or simply phonetically written for the newspaper. Or, it could have been a misprint during publication. We do not have the original submission, only a copy of the article itself. And here I adjourn and bid you all thanks and good day! Holly, My wife is a descendent of the John MacLellan that settled in Indian River, P.E.I. I believe that I have found the location of Glaich Liath. If you email me, I´ll send you what I have found. Kipp. My wife is a direct descendant of John MacLellan through his daughter, Catherine. I am a retired Fire Captain from Danbury, CT, USA and we have been living on PEI since 2005, My wife’s mother was born here. I have done lots of research on the MacLellan family but I have not heard of the MacLellan ledger book. I mention Glaigh Laith because I have read that it is where they lived on South Uist. I had never been able to determine exactly were it was on South Uist and I don’t know if anyone else has been able to find it. I believe that I have found its location and I would like to share it with all those that descend from this line. The aerial view of Loch Corradale and Glen Uisinis (uis – welcoming; nis – headland) shows the layout and relative inaccessibility of the neighbourhood. There is a main road that runs the length of South Uist and just south of Howmore (Tobha Mor; tobha – hoe, mor – large,so presumably hard work to cultivate) a minor road, perhaps little more than a track, cuts off east towards Loch Uisinis. This road proceeds through a narrow gap that separates the largest hills on the island, Hecla and Benmore, and then through Glen Corrodale (corra – crooked or spindly; dail – pasture or meadow) to reach the sea. Once there and nearby there is the legendary cave, Uamh a’Phrionnsa (uamh – cave; prionnsa – prince), said to have concealed Prince Charles Stewart from pursuers. More to the point, someone has got there before you, a Holly MacLellan, presumably a relative. It looks like a very remote spot (I must visit it myself some day) and presumably your ancestors often went elsewhere by boat. ‘Usinish Lighthouse, built by D. and T. Stevenson in 1857, was a Tower, built unusually all of brick, which has a surviving perimeter wall and latrines (although the cottages have been reduced to footings). Automated in 1970, it is accessible only by boat, or by foot through the isolated glens that descend east from Beinn Mhor, Corodale and Hecla. These now empty glens are scattered with souterrains, abandoned dwellings and shieling huts’. ‘This island lighthouse defines the west shore of the Sea of the Hebrides from an isolated situation on the east coast of South Uist. Buildings and a helipad have benn constructed to the west of the lighthouse itself. Information from RCAHMS (RJCM), 14 August 2008. R W Munro 1979; K Allardyce and E M Hood 1986; S Krauskopf 2001. It occurs to me that the MacLellans were located in this very remote spot to man or otherwise support the operation of Usinish lighthouse? In honour of these MacLellans from Glacklee, I have placed a photographic image of the ruins of their settlement as a header on the Bookclub page. BTW Trekking to Uisinish Bay is not to be undertaken lightly. A recent and experienced hillwalker reports that it took him almost 4 hours to get there. That was his second attempt as his first had to be interrupted due to a twisted ankle. Roy, I also live in Ct. I’m up near Norwich. Small world. The ledger book was passed down in the family to Angus and Maryjane MacLellan, to their son, Joseph, to his son, Peter, and now to his sons who run Shore Lane Farm off of MacLellan Road in Indian River, PEI. I copied many pages in 1992 but the whole thing should be copied and shared to all and preserved. I know Holly recently through Ancestry.com and she found out through a DNA project that John was a MacDonald, taken in by the South Uist MacLellans and called a brother. I suppose Joseph MacLellan who wrote the emigrant story either phonetically spelled the place names or that was what they were called then. You might want to contact Kenny and Clare MacLellan and see if they would show you the book. Hello Roy, I am descended from both John and Angus MacLellan. From what line are you? This location is near Loch Oinart ( Eynort ) and Uisinish. I have a bit of info about them. Are you familiar with the MacLellan ledger book? Pre-eminent amongst Canadian Gaelic Scholars were the Reverend MacLean Sinclairs of Barney’s Ridge. The younger Reverend MacLean Sinclair was a fastidious collector but found himself on the brunt of severe criticism for butchering of old texts. His apologists gave the reason for his censure of “indelicate expressions” as no mystery: he was a Presbyterian minister in an age when moral standards were becoming increasingly austere. However, one apologist went on to say ‘ one wonders how much Gaelic poetry was lost to Maclean Sinclair’s hearth’. With shades of ‘Tam O’Shanter’ (perhaps a take-off from Rabbie Burns), this ditty tells about a persuasive or unscrupulous emigration agent, take your pick. If any translation is required, contact me on this website. ‘Patrick MacPherson, the author of this song in the mock-heroic strain, was known as Padruig MacDhomhnuill. He was born at Torlum, lived at lochdar for a while, was steamboat agent at Lochcarnan for some years, and died at Torlum in 1884, in the 84th year of his age. Patrick was a wellknown rhymster and humorist in his day, and many of his witty sayings are current in Benbecula. MacNiven, the ‘hero’ of the song, was an emigration agent and a native of Isla. In this song Patrick takes the unusual course, emigration being always unpopular in the Islands, of praising the emigration agent as the provider of fertile lands across the sea. Not the least of MacNiven’s virtues, in his estimation, was that when others called for a bottle of strong beverage, MacNiven was not content with less than a gallon at a time’. PS. A less charitable observation (from myself) is that the goose feather, ‘it an t-sulaire’, would have been a quill used to write with ink, produced by MacNiven to those he had filled up with too much whiskey, so as to sign them up to emigrating to Canada. The inebriated (courtesy of MacNiven) and impoverished revellers would not have had to pay for the passage and MacNiven would have got a handsome commission. In other words, MacNiven sounds like a modern-day insurance salesman. The reference to his horsemanship sounds like he rode hell for leather as soon as he saw a tall ship in port, so as not to miss a trick, him and his gallons of whiskey. This man was my GG-grandfather, I feel sick! ‘Si t’ intinn bhiodh suas. ‘Cur deoch-slàinte mu ‘n cuairt. Bu ghlan sealladh is snuadh. ‘S dheanta ‘n cumhnanta suas. Far an samhaich ‘m bi cuan. ‘Dol gu sàile gu luath. Le beagan àisig ga ‘m buain. From ‘Emigration from Scotland between the Wars’, Marjory Harper. Andrew MacDonell, an erstwhile Benedictine monk, persuaded the Canadian authorities to send him on a recruitment drive to Scotland and he urged his masters to capitalise on a ‘prevailing spirit of restlessness’ in the Highlands. 291 emigrants embarked on the SS Marloch at Lochboisdale on 15 April 1923, bound for Red Deer, Alberta, where MacDonell had been given a five year lease on a disused farm school to train recruits before moving them on to waged work or farms of their own. Recruitment in Scotland was delegated to the Castlebay, Barra, priest Donald MacIntyre, who in 1922 had led a delegation to the prairies to identify a best location. MacDonell’s most ambitious venture was in 1926 when he attempted to create a colony of Hebridean Catholics at Vermilion, North Alberta. A 30,000 acre tract of land was purchased by the Scottish Immigration Society, and the Canadian and British governments. Opinion was divided as to whether MacDonell had engineered a ‘notable piece of work’ or an ‘ill-conceived fiasco’. Total numbers of adult passengers per district is in brackets. From Annie Barr re. correspondence from Susan O’Meara. ‘Here is a copy of what Susan has had to face in her quest. The illiteracy and accents for this group seems to have made a mess in the records and the parish records are almost worse than the census records. First names like Ronald were incorrectly recorded as Raul & Reynold; Malcolm was sometimes recorded as Columban; Isabel was sometimes recorded as Elizabeth; Effy recorded as Afy or Eva. Surnames were even worse. McKenyan was McKinnon; McVeigh was sometimes used for McPhee as was McFee; McCastle was supposed to be McCaskill; Buoey as Bowey; McNeil often shown as O’Neil and of course, the McGinnis version was probably the most incorrectly spelled. Sometimes they would even be recorded as McGinish or just McGin. P.S. At least I will be able to tell her what “Columban” should have read. I don’t speak Gaelic but know a few bits and pieces to get me by on my family history’. Maybe not so much illiteracy as lost in translation or based upon clumsy use of phonetics i.e. a ‘sounds a bit like….’ approach. The Gaelic for Ronald is ‘Raghnall’, sounds a bit like Raoul and could easily be mistaken for Reynold; Malcolm is ‘Callum’or ‘Colm’ in Irish, hence Colum-ban (maybe even Calum Ban, Fair-haired Malcolm, as personal descriptors were commonplace as add-ons); no excuse for Effy (short for Euphemia), which is ‘Oighrig’ in Gaelic, hence sounds nothing like Eva. I have researched my wife’s M’Cormick roots from the Uists, but have not been able to establish some of the more important links that are necessary to be able to locate living rellies on the Islands. The reason I’m responding to your posting to the Western Isles board on Rootsweb is that one of the ladies who married into that M’Cormick family that emigrated to Cape Breton in the mid-1800s (I believe) was an Annie Ferguson, who was the first wife of Angus M’Comick, who was born in Benbecula about 1811. It is believed that Annie was a daughter of a Ewen Ferguson, who was also born in Scotland. Angus and Annie had three or four children, John, Effie, Flora, and possibly a Mary Ann, who may have been twin sister to John. I believe that those two may have been born in Scotland, but Effie & Flora seem to have been born in the Gabarus area of Cape Breton, about 1850. I believe that Angus was the oldest son of a John Frank M’Cormick of Benbecula, who was married to an Effie Nicholson of (possibly) S. Uist. However, the John Frank / Effie family became Protestant (John F. was born in a Catholic family), and the family story is that they moved to Lochmaddy. There, the family of Angus, Margaret, John Jr., and Penny were born. Angus, Margaret and John Jr. seem to have emigrated to Cape Breton, possibly with their father, but Penny remained behind and married Donald Og Currie of S. Uist. That Currie family later emigrated to Cape Breton and farmed in the Upper Mira River area (above Victoria Bridge). One of the John M’Cormicks (father or son) who emigrated to the Gabarus area was a weaver of some reputation, and was noted for having taught his countrymen of the Gabarus / Belfry Lake area how to weave. He also taught (I believe) one of the men from a related family how to build a loom, so that others in the area could weave their own cloth. A grandson of John Jr., Hector by name, was in the Canadian Navy during WWII and visited Benbecula. He gave a related widow M’Cormick an awful fright when she saw him walking up the lane to her house, as he looked so much like her deceased husband. Hector said that the rellies he visited in Benbecula were not only astonished to learn that they had kinfolk in Cape Breton; they completely blown away to learn that those rellies were staunch Presbyterians! In fact, the brothers, Angus and John Jr. had both been elders in the Gabarus Lake Presbyterian Church. I don’t know if this makes any sense to you or not, Don, but hope that it may fit some of the data that you have in hand. If so, and you can add anything that will help me resolve some of my outstanding brick walls about the early days in the Uists, or provide something that could permit members of my wife’s family to contact living rellies in Benbecula or elsewhere, I’d be most grateful. This response is courtesy of Angus MacMillan (ex-Benbecula) from correspondence with Don MacFarlane alias ‘Londonderry’. 1. The Lulan was not the only charter from the Uists for two reasons. There were others e.g. the ships that took the much larger emigrations of 1850-51 called in North Uist though their eventual destination turned out to be Ontario rather than the Atlantic provinces. It is not clear that this was intentional and indeed it is doubtful if some of the voluntary leavers of the time would have gone at all had they known they were not to be delivered to their predecessors neighbours and relations who had already settled in PEI and Cape Breton. The explanation is that the shipping service was a two-way affair. Timber was taken from Canada to the UK and then an extra floor was inserted to accommodate migrants for the return trip. Timber in commercial quantities in Cape Breton ran out quite suddenly in about 1844 and the PEI trade had already died. As a result, the next batches of migrants found themselves in Quebec, Upper Canada now supplying the timber. They could not in general afford the fare to return and so were ferried on subsidised trips up the St Lawrence by the entrepreneurs who were opening up large parcels of land in Ontario. In fact, two successive loads of the 1850/51 settlers found themselves separated by some hundreds of miles as some were ferried only as far as modern Toronto and then found their way north to Glenelg, Grey County, while others were transported to Hamilton and then marched through thick woodlands to East and West Williams close to present day London, Ontario. The second reason mentioned in the first sentence is that the Lulan did not leave from the Uists. As I described in my earlier note, it was plan B for a group of unfortunates who aborted a passage to New York and existed on the quay in Glasgow until alternative berths could be found. This was the cause of their destitution. As far as the Uists were concerned, there were other voyages that left from the islands before the 1840s but, once other embarkation points were involved, they were not so far as I know involved with Wester Ross but focused on Tobermory and then Glasgow. 2. The Wester Ross voyages had presumably started with the Hector trip to Pictou in 1772? 3. Under the Colonel Gordon regime, in the early 1840s, six major sheep farms such as Kilbride were carved out of South Uist and the eastern pendicles around Loch Eynort, Calvay etc. were totally cleared, the folks being dumped pro tem on the infertile moss of Stoneybridge. The better quality kelp in Benbecula, which commanded a higher price and the fact that the areas like Craigstrome suitable for more extensive sheep farming had not been lotted off, saved Benbecula from that sort of general clearance activity. The only real exception was that Aird was so wet in its central parts that residents and cottars had settled permanently out on the Muir, which was intended as summer pasture. The Colonel’s family wanted to extend the Nunton parkland and the old Belfinlay and parts of the Muir were taken into the home farm, the walls being built from the stones of the houses. Apart from those folks, mainly cottars, those who left the island were distinctly the better heeled, notably the artisans who were a bit more cash rich than the crofting norm. The Allan Black, boat builder is an example. His brother Donald was a blacksmith as were the Balivanich MacMillans who left. There is just the one case of a forcible eviction such as those so prominent in the books, that we know of. A blind crofter in Torlum was evicted and his son was one of those tied and thrown into the boats. 4&5. The Lulan was rated A1 at Lloyds; even if no-one cared too much about the migrants, the timber was valuable. It is very unlikely to have been the cause of the disease aboard. The six week sojourn in the open and, having paid what monies they had to the first ship bound for New York, their destitution and starvation on the Glasgow quayside, together with being exposed to unfamiliar germs, much more satisfactorily explains the health problems on the voyage. From memory, it was the factor [who will have been William Birnie at the time] who intervened to arrange the Lulan passage and that is where the confusion arose at the other end about payment. I have a feeling, again from memory, that it was the matter of provision for the first winter that was at particular issue, the locals in CB/PEI objecting to having to bail out destitute arrivals from Britain. In 1848, the Uists and their population were in a bad state post potato famine. Typhus was a more familiar visitor than smallpox but both appeared from time to time. However, I don’t think there was an outbreak of either around 1848. 6. Only a proportion of those who disappeared from the islands show up in Canada so it has to be assumed that many did indeed find themselves in Glasgow and meeting under the ‘Hielanman’s Umbrella’ at the west end of Sauchiehall Street in the city for their social life. The attractions of Canada, right through to the Clandonald migration of the 1920s was at least as much the expectation of being able to settle cheek by jowl with Gaelic speaking relations as simply hope of a better life. 7. It is easy to overestimate the extent to which news could ‘get back’ from those who went before. Tradition is full of stories of later migrants searching for years before they tracked down their own siblings. In the early 19th Century, there was only one man in Benbecula who could write so the chance of letters from leavers prior to, say, the Cathcart migrations of 1883/4, were effectively non-existent. As I mentioned, the Blacks are a perfect example as, till I put the groups back in touch, there had been no contact from 1851 to about 1997. There are six MacMillan brothers in Glenelg who thought their family, 1851 migrants, was from the Orkneys until I pointed them to Balivanich. There was just one avenue open for such CB contacts with Benbecula that I know of; one of the MacDonald Gruder family from Lionacleit that went to Cape Breton about 1844 was a sailor and it is thought that on at least one occasion, when his ship called at Liverpool, he managed to make the pilgrimage north. 9. As the Lulan sailed from Glasgow, it had a full complement of mainland migrants. 10. Not just bad English, effectively none. The first from the islands to go to do summer work on the mainland is recorded as having taken that step in 1853. That was the main source for a smattering of English, and it was just such a smattering, no more, that led to folks to be on a New York bound ship out in the Firth of Clyde in the first place and just lucky that someone had just enough English to realise the destination before it was too late. If in doubt about all this, have a look at the notes to Carmina Gadelica and look for the Mary MacMillan, Lionacuidhe story dating from as late as 1870-80. The exception to this may well have been the incomers from Lewis and Skye such as your folks, who will have been exposed to some English – and a couple of MacAulay merchants could actually write at the time. 11. Heiskeir was inhabited and unable to support its own population at the time and was, in any case MacDonald of Sleat country so not available to indigent Catholics from South Uist. The evidence to the Napier Commission at Torlum in 1883 is revealing about the thought that somehow there was sufficient land to meet the needs of all if only it were made available. Donald MacDonald from 1 Torlum, who gave that township’s evidence got into a terrible bind trying to substantiate that claim. Most Scottish emigrants to British North America in the mid-nineteenth century travelled on the Canadian Allan and Anchor Lines. The unfortunate clipper, ‘Pomona’, a flagship for that journey and definitely not the ‘Pomona’ of Captain Rory McQuien which was lost on a different date, foundered in heavy seas on April 30th, 1859, off the coast of Wexford in Southern Ireland with the loss of 380 lives. Of those saved, 3 were passengers and 18 were crew. The Pomona met high winds a little after midnight when nearing Tuskar, the captain lost his bearings in the dark (?) and the clipper was driven into a sandbank seven miles off Ballyconigar. The sea breached over her sweeping decks and, as morning approached, attempts were made by crew to launch a life boat. The lifeboat stove in when hitting the side of the vessel and those crew perished. All on board remained in fearful suspense till evening when the stern slipped off the sandbank into deep water, filling the clipper rapidly. Captain Merrihew, 1st and 2nd mates stayed on the ship and perished. 3rd mate Stephen Kelly made it to shore with 18 crew and 3 passengers. Mr Deveraux, owner of the steam tug Erin, towed two lifeboats to the scene but when the steamer arrived only the mizen mast was above water. From this the colours had been taken down. On the beach at Ballyconigar were found the lifeless remains of several of the unfortunate passengers – a woman of about 40yrs, well-dressed and handsome, a young man of about 25, an American captain’s wife and their 17 yr old daughter, a 20yr old woman of beauty and poorly clothed, and a 6month old baby. What is clear from this report is that half the crew managed to make it to safety, but only three of the 380 passengers, also leaving the senior officers on board. These survivors did not swim 7 miles to shore and escaped on a whaler as the lifeboat had been stoved in. At a coroner’s inquest, the 3rd Mate and the only survivor from the officers, offered no explanation for the disaster. Philip Mulcahey, the passengers’ cook, deposed that the ship’s crew gave no thought to saving the lives of the passengers. The inquest reported there was no proof of the Captain’s drunkenness but the members heartily condemned that portion of the crew which deserted their passengers, occupying the boats to the exclusion of women and children. The coroner called for a further inquiry by the Lords of Admiralty and he recommended that future seamen surviving the loss of a ship should be detained until due inquiry was made. It appears there was an attempt at a posthumous slur against the name of Captain Merrihew who died at his post. He would have been horrified at the actions of his crew and his only fault was missing, in poor visibility and in hurricane conditions, the infamous Tuscar Rock, that graveyard of many a ship in these waters, only to strike a sandback 7 miles out from shore. Migratory patterns from Scotland to Prince Edward Island (PEI), Cape Breton and Nova Scotia. 1. The earliest to come to P. E. I. in large numbers were from the Clanranald territories and the Lordship of the Isles (essentially Catholic). This comprised the west central Highlands (Moidart), the Small Isles and the southern Outer Hebrides. 2. The next important group (and the largest overall) came from the Isle of Skye, the Isle of Raasay and the adjacent mainland of Wester Ross. The MacDonalds, the MacLeods and the MacKenzie’s were the dominant political families and most of the area had been recently converted to Presbyterianism. 3. The third largest group (the Lord Selkirk scheme) hailed from the northern Isles of Argyll; Mull, Coll and Colonsay, with much smaller representation from the mainland of Ardnamurchan and the other Isles. Most of this district had also been recently converted to Presbyterianism. 4. The fourth largest group came from Perthshire in the eastern Highlands. This area tended to be divided between the Stewart controlled territories in the west and regions controlled by the Duke of Athol and by the Gordons of Huntly in the east. This area had a strong representation of Episcopalians and a smaller but significant Baptist following. 5. The final group came from Sutherland from MacKay Country. It was one of the earliest areas to have been converted to the Presbyterian faith and the only one to have fully supported the Hanoverian dynasty during the Jacobite Rising. Eoghan Og, after his marriage, removed himself to Sight Point, near Judique in Cape Breton, where he took up a farm and remained about twenty years. Eoghan had a penchant for composing vitriolic songs at the expense of his Sight Point neighbours, which were not malicious but stung painfully. I am guilty as charged, I am a MacDonald. To complicate matters more, the other side of the family (my father’s mother’s side) is also MacDonald. Researching this name is a real challenge. When the church burnt down and all the records with it, we lost our connection with those first settlers. The ancestor that fought at the Plains of Abraham was Laughlin MacDonald or L. Donald MacDonald. We have found his name on the land grants on PEI but we suspect that there were 2 Laughlins or a Donald and a Laughlin, possibly a father and son or 2 brothers. The reason why we think there were 2 is that there is a consistent discrepency in the dates in what documents we have found. It seems to have been a common practice to give the same name to several children in the family. So maybe it was 2 brothers. When you mentioned about the ships departing from Scotland to PEI and the people having an emigration agent this would fit my grandmother’s families emigration but probably not the soldier’s family. The early settlers consisted of a small group of people that came to the northeast section of PEI. I think the first parish was only a few families. I read some research material gathered by a man from PEI that mentioned an article in the “Scots Magazine” in the 1760′s (Was there such a thing?). The article was written about a small vessel, name unknown of course, that was preparing to leave for PEI, then called St. John’s Island. The people preparing to leave on this ship or boat were from Uist and were soldiers taking their families to live on PEI. Have you ever run across this publication “Scots Magazine” in your research? I would be interested to read the full article if it does exist. I spoke to my brother and told him about this website and what I had written. He says this soldier also spoke some Italian. Sounds crazy to me but who knows? Any thoughts on my soldier would be greatly appreciated. Memorandum of arrangements with the Canadian Government and the Principal Land Companies for starting a Colonisation Scheme for the Crofters and Cottars of the Western Highlands and Islands of Scotland (1888). ‘Each [emigrant] was assisted with a loan of £100, which was made a charge on the homestead, in accordance with the provisions of the Dominion Land Act. Every necessary convenience was afforded the party by her [Lady Cathcart’s] representative, and also by the Canadian Government’s agent at Brandon. No houses were built for them but they lodged for a time in tents, and ultimately erected some turf and log houses for themselves, much after the style of those they quitted in Scotland’. ‘The Settlers seemed industrious, they appeared cheerful – a necessary factor for success – and their belongings were estimated as being worth £260 on an average. A different condition of affairs arose when expiry of the second year of tenancy, the initial repayment, fell due. Instead of speaking of their ease and comfort, the party complained of poverty and want, but to what extent this condition of need actually existed is somewhat doubtful’. ‘When heard of twenty-three years later the settlers were hopelessly in arrears, only one amongst them having paid both capital and interest in full. Financially the scheme has been an undoubted failure, but as the people have improved their conditions of life, and as the majority of them have kept to their plots, some measure of success must be credited to Lady Cathcart’s efforts. The average cultivation of land for each settler would be about one hundred and fifty acres’. ‘Lady Gordon Cathcart was anxious to know how the colony of crofters between Moosomin and Wapella was succeeding. The first ten or twelve years were a struggle, but the young men grew up able to earn money, and the settlement to-day is all right and the people doing well. They have good buildings, good horses and cattle, good machinery and equipment, and the schools and churches are very good. There seems to exist some grounds for alleging that the settlers could have repaid their loans, but did not feel inclined to do so. One man rather resented the idea that he ought to repay it; he thought he had quite done his duty in going out that he was, in fact, more a creditor than a debtor’. ‘English is spoken exclusively by the younger people, but the older ones, although they speak English, prefer the mother tongue’. I’ve recently received my family’s day-by-day record of the transit of the Hebridean Scots that left Benbecula for Canada in April 1883. It begins with: “We emigrants left Benbecula Monday, April 9, 1883 after bidding goodbye to all our friends and acquaintances who were very sorry to see us leave.” My gg grandfather and family were part of the Lady Cathcart Settlers, travelling to Saskatchewan, Canada with nine other Hebridean families (I wonder what they were doing this Saturday night 129 years ago?). I’ve shared this document with Angus MacMillan (who expertly responds on the Uist page of this website and who has a wonderful wealth of knowledge when it comes to this group of emigrants). I would love to connect and share stories with any others who are researching the Lady Cathcart Settlers. The diary entries also say that a photograph of the settlers was taken when they reached Winnipeg on Tuesday, May 8, 1883. If anyone has this photograph, I’d love a copy. I spoke to a very, very distant relative in Moosomin, Saskatchewan yesterday. We discussed that next year (2013) is the 130th anniversary of the arrival of the first Lady Cathcart settlers. He is interested in having an anniversary celebration next summer. I’m travelling to the area in June to discuss this further. I’ll let you know if something comes of this very preliminary thought. Along a similar vein, descendants of a group of emigrants from Derry, Northern Ireland, who left for New South Wales in 1837 on the fateful Adam Lodge voyage are having a reunion this Summer in NSW. They are expecting at least a thousand people to be in attendance and the BBC have been in touch with me for contacts and details. I am researching the families of Morrison, Steele, and M(a)cDonald from Cape Breton NS between the years 1825 to the 1861 Canadian census, looking for their Scottish family origins of Benbecula and North/South Uist, maybe Isle of Lewis. The furthest back I could find were of the following married couples. Donald Morrison married to Ann M(a)cDonald, records indicate both born in Benbecula, 1815-1835. John Steele married Flora M(a)cDonald, she born in Scotland, unsure if he was. Only nine Steele families in the Cape Breton 1861 census. Are these three family surnames common to the same three areas prior to the immigration of many Scottish families to Cape Breton, Nova Scotia in the 18th and 19th century? And did most families travel as a clan family, as opposed to individual persons leaving to go to Canada alone? What prompted such a large flux of Scots to leave the Western Isles and head to Canada? These names are all common in the areas you mention. MacDonalds were and are much to be found in the MacDonald of Sleat island of North Uist and the Clanranald islands of Benbecula and South Uist. Dr Alasdair MacLean suggested in his Transactions of the Gaelic Society of Inverness article ‘Notes on South Uist Families’ that more than half the families in that island carried the MacDonald name. Morrison was the name of the Brieves or lawgivers in Lewis and the adjacent mainland. Some moved south to the other islands [not least from Pabbay when they were caught distilling illicit hooch] and there may have been a borrowing of the name in Uist folks when surnames were Anglicised. Steele is known to be a South Uist name and, in association with O’Henley, is said to be a sure sign of a Uist settlement anywhere in the world. There was a tendency for families to travel in groups, perhaps for cultural and language reasons. Successive migrations allowed newcomers to find support from those who had moved earlier. As for the reasons for emigration, they were to a significant extent economic. The chiefs were acting increasingly like commercial landlords and rights to land were unobtainable. Clearance played a part in some areas but it tends to be overstated as a cause. The collapse of kelping when the Napoleonic wars ended gave a boost to emigration from the 1820s to about 1850. I suspect the John Steele you mention was Iain Mor, son of the Alasdair Steele who arrived in Sydney on the Harmony in 1821 and who later married Mairi ni’ Alasdair nic Ailein MacDonald b. c. 1795, from Boisdale, Bras d’Or. John and family settled in Glace Bay at what became Steele’s Hill. The couple seemingly had eleven children. The wife’s family was, I think, quite closely associated with the Beatons and so may have been from Benbecula. Alasdair Steele will have been from South Uist, very probably from the southern end of the island, as there is no sign in any of the rather sporadic records of the Steeles having settled in Benbecula. I do not at first sight recognise the other couples and I suspect they may have left either as children or simply before detailed records become available with the 1841 Census.